You can trust God. Many of you are going through the biggest storm of your life, but I want you to know that you can really trust God. I’m not a motivational speaker. I’m not trying to be cliche with things that all Christians may say. I’m not telling you something that I haven’t experienced. 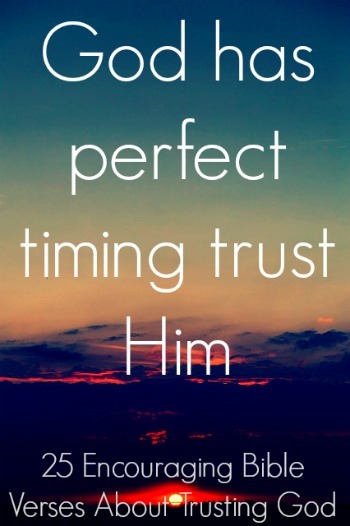 There have been many times where I had to trust God. I’ve been through the fire. I know how it is. You can trust Him. He is faithful. If you are going through a job loss I want you to know that I’ve been laid off before. If you are going through financial troubles I want you to know that there was a time in my walk with Christ where I literally had nothing, but Christ. If you lost a loved one I want you to know that I have lost a loved one. If you have ever been disappointed I want you to know that I’ve failed, I’ve made mistakes, and I’ve been disappointed many times. If you have a broken heart I want you to know that I know how it feels to have a broken heart. If you are going through situations where your name is being slandered I’ve been through that pain. I’ve been through the fire, but God has been faithful one situation after another. There has never been a time when God didn’t provide for me. Never! I’ve seen God move even though for some situations it took a while. He was building in me a faith unlike any other. He’s been working in me through the many hard times. Why do we cast so much doubt on the power of the living God? Why? This website was built on trusting God. Some websites are watered down, they add no commentary, and there is a lot of false things being preached online. God led me to make a website for His glory. I was working on the first website for a few months. I was doing everything in the flesh. I would rarely pray. I was doing everything on my own strength. The website was slowly growing, but then it totally flopped. I was working on it for a few more months, but it never recovered. I had to trash it. I was so disappointed. “God I thought this was your will.” In my tears I would cry out and pray. Then, the next day I would cry out and pray. Then, one day God gave me a word. I was wrestling with God by my bedside and I said, “please Lord let me not be put to shame.” I remember it like it was yesterday. When I was done praying I saw the answer to my prayers in front of me on the computer screen. I never looked up any verses about shame. I don’t know how it got there, but when I looked at my computer screen I saw Isaiah 54 “do not be afraid; you will not be put to shame.” I just prayed for it and the first thing I saw when I opened my eyes was a comforting message from the Lord. This was no coincidence. Don’t feel shame for something that glorifies God. Hold on to God’s promises even if it is not going as planned at the moment. If God has told you to do something in prayer, then do it. You can trust Him. When God rejected my first website what He was doing was working. He was building experience, He was building me, He was building my prayer life, He was teaching me, He was showing me that without Him I am nothing and I can do nothing. He wanted me to wrestle in prayer. Through this time I endured some big trials and some small trials that would test my faith. Months later God would lead me to start a new site and He led me to the name Bible Reasons. This time I felt transformed in my prayer life and in my theology. This time I knew God intimately. I wasn’t just writing about something I haven’t been through. I’ve actually been through it so I can write about it. One of my first articles was reasons why God allows trials. At the time I was going through a small trial. God has been faithful through it. I literally watched God make a way and lead me into different directions to reach my destination. By faith I believed these words were for me. God was telling me there is no plan B you’re still in plan A. There is nothing that you can do to hinder God’s plan. No plan of God can be stopped. I would constantly keep on seeing 1:37 or 137 everywhere I went or everywhere I turned as a reminder that God is going to be faithful. Hold on! You can trust God. I won’t boast in self or in a ministry because I am nothing and anything I do is nothing without God. I will say that God’s name is being gloried. God has been faithful. God made a way. God gets all the glory. It took a while in my impatient standards, but God never broke His promise to me. Sometimes when I look back at the journey throughout the years all I can say is, “wow! My God is glorious!” Don’t listen to Satan. Whatever is bothering you or whatever you have lost God is able to restore. I got fired from a job that I hated, but God ended up giving me a job that I love. I lost one thing, but through that loss I was restored an even greater blessing. God is able to give you double of what you have lost. I’m not preaching the false prosperity gospel. I’m not saying that God wants to make you rich, give you a big house, or give you good health. However, many times God does bless people with more than their needs and He does restore. Praise God for these things. God does bless people financially. God does heal people physically. God does fix marriages. Many times God gives more than what is expected. God is able! We must never forget though it is by His mercy and His grace. We deserve nothing and everything is for His glory. What does the Bible say about trusting God? 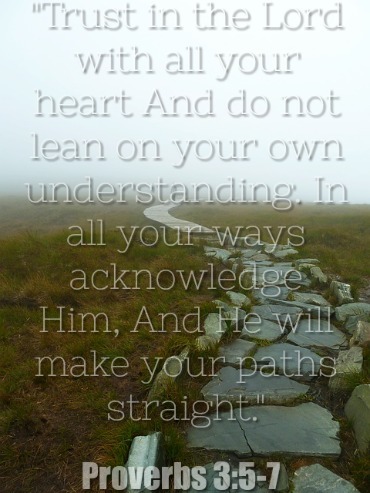 Don’t lean on your own understanding. Satan will try to send you confusion and temptation in tough times. 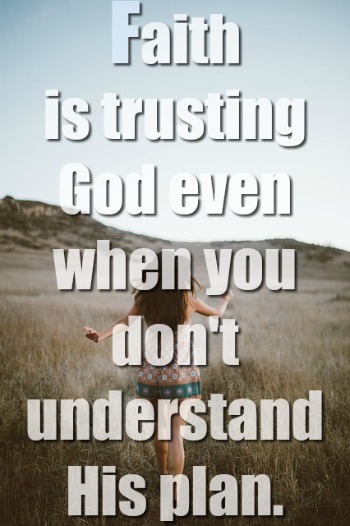 Stop trying to figure out why and trust in the Lord. Don’t listen to all those voices in your head, but instead trust in the Lord. Look at Proverbs 3:5-7. This verse says to trust in the Lord with all your heart. It doesn’t say to trust in yourself. It doesn’t say try to figure everything out. Acknowledge God in everything you do. Acknowledge Him in your prayers and in every direction of your life and God will be faithful to lead you on the right path. Verse 7 is a great verse. Fear God and turn from evil. When you stop trusting in God and you start leaning onto your own understanding you start making bad decisions. For example, you’re in a financial crises so instead of trusting in God you lie on your taxes. God hasn’t provided you with a spouse yet so you take matters into your own hands and seek an unbeliever. This is a time to just trust. The victory doesn’t come by doing things in this flesh. It comes by trusting in the Lord. Some people wonder why are they in difficult situations. “Where is God?” God is here, but you need experience. If I have a problem I’m not going to want to go to someone who has never been through what I’ve been through. I’m going to someone who has actually lived it. I’m going to someone with experience. You can trust God. Nothing that you go through is meaningless. It is doing something. He never abandoned you. No, you have given up! Just because you are going through hard times does not mean that He has abandoned you. That doesn’t mean that He doesn’t hear you. Sometimes you have to wrestle with God for 5 years. There are some prayers that I had to wrestle with God for 3 years before He answered. You have to fight in prayer. It is not God who quits. It is us who quit and give up. Sometimes God answers in 2 days. Sometimes God answers in 2 years. Some of you have been praying for that one unsaved family member for 10 years. Continue to wrestle! He is faithful. Nothing is impossible for Him. “I will not let you go until you answer me!” We need to be like Jacob and wrestle with God until we die. Blessed are those who wait on the Lord. The sin that grieves God’s heart the most is doubt. Just recently my prayers got answered to something I have been coming to God about for a long time. God brought me to a verse that had the numbers 137 just like in Luke 1:37. A few weeks later God gave me an even greater blessing within my trial. I realized I was going in the wrong direction. God put the roadblock so I would take a different route. If He didn’t put the roadblock I would have remained on the same path and I wouldn’t have made the necessary turns. Once again this recently happened and this is one of the greatest victories in my life. Sometimes things you go through now are leading you to a future blessing. My trial was a true blessing in disguise. Glory to God! Allow God to work out your situation. One of the greatest blessings is to see firsthand how God works everything together. Enjoy your trial. Don’t waste it. Hold on to the righteousness of Christ. Don’t seek to make your own. Don’t think God has not made a way because you are not godly enough. We all have done that. It’s because I’m struggling in this area, it’s because I am struggling with these desires. No. Be still and trust in the Lord. Allow Him to calm the storm in your heart and just trust. God is in control. Stop doubting God’s great love for you. This is a promise for those who have a passion for the Lord and His Kingdom. This is a promise for those who seek to glorify God above all. This is a promise for those who struggle with such a thing. This is a promise for those who are going to wrestle with God no matter what it takes. This is not a promise for those who want to glorify self, who want to seek riches, who want to be well known, who want to have a big ministry. This promise is for the Lord and His glory and if your heart is for that, then you can trust that God will fulfill this promise. If you’re struggling with trusting God you have to get to know the Lord in prayer. Be alone with Him and get to know Him intimately. Set your heart on knowing Him. Also, you have to get to know Him in His Word daily. You will notice that many godly men in Scripture were put in tougher situations than us, but God delivered them. God can fix anything. Readjust your spiritual life today! Write down your prayers in a prayer journal and write down every time God has answered a prayer as a reminder of His faithfulness. 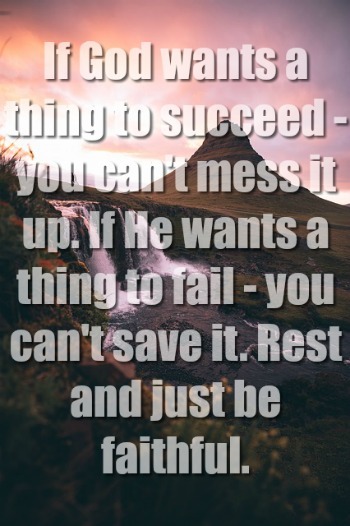 How Do You Find Peace And Rest? This article/post whatever you call above has blessed and encouraged me in every way I needed. Thank you for always giving such an extensive explanation and reason as to why we can trust God. As always after reading I am back in the loving long arms of God and our Lord trusting him again. We so often slip and forget. But you here and this website always have me returning.